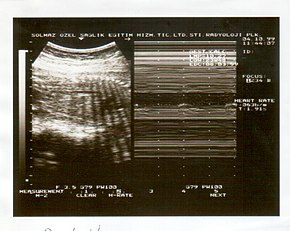 A biophysical profile (BPP) is a prenatal ultrasound evaluation of fetal well-being involving a scoring system, with the score being termed Manning's score. It is often done when a non-stress test (NST) is non reactive, or for other obstetrical indications. The "modified biophysical profile" consists of the NST and amniotic fluid index only. Use of vibroacoustic stimulation to accelerate evaluation has been described. Each assessment is graded either 0 or 2 points, and then added up to yield a number between 0 and 10. A BPP of 8 or 10 is generally considered reassuring. A BPP normally is not performed before the second half of a pregnancy, since fetal movements do not occur in the first half. The presence of these biophysical variables implies absence of significant central nervous system hypoxemia/acidemia at the time of testing. By comparison, a compromised fetus typically exhibits loss of accelerations of the fetal heart rate (FHR), decreased body movement and breathing, hypotonia, and, less acutely, decreased amniotic fluid volume. ^ Lalor, J. G.; Fawole, B.; Alfirevic, Z.; Devane, D. (2008-01-23). "Biophysical profile for fetal assessment in high risk pregnancies". The Cochrane Database of Systematic Reviews (1): CD000038. doi:10.1002/14651858.CD000038.pub2. ISSN 1469-493X. PMID 18253968. ^ a b c d e "Biophysical Profile, Ultrasound: eMedicine Radiology". Retrieved 2009-12-29. ^ Pinette MG, Blackstone J, Wax JR, Cartin A (June 2005). "Using fetal acoustic stimulation to shorten the biophysical profile". J Clin Ultrasound. 33 (5): 223–5. doi:10.1002/jcu.20116. PMID 16047387.